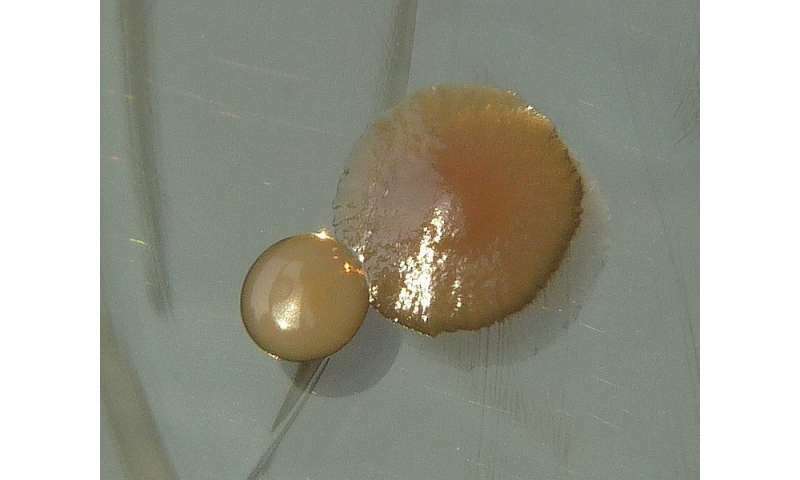 Colonies of Pseudomonas aeruginosa and Staphylococcus aureus (yellow pigment) onTryptic Soy Agar. Cultivation 24 hours, 37°C. The bacteria Pseudomonas aeruginosa can cause serious and difficult to treat infections. The infection process involves the activation of toxic substances from the bacteria by a common protein in our cells. Researchers at Karolinska Institutet in Sweden now show how this happens and that the activation can be stopped with drug-like molecules. The results are presented in Nature Communications. Pseudomonas aeruginosa infections are a common problem in hospitals. Antibiotic-resistant strains of the bacteria can cause life-threatening infections in patients with reduced immunity or large, open wounds. The bacteria also cause infection of the airways, which makes people with respiratory impairment, such as cystic fibrosis, particularly vulnerable. To find new means of treating these infections, researchers at Karolinska Institutet, Umeå University and Yale University have mapped the three-dimensional structure of two toxic proteins that the bacteria use to trigger the infection process. The researchers have determined the structure of these toxins, called ExoS and ExoT, along with a human protein, called 14-3-3, which is known to be necessary for the toxins to become active. Previously, only little was known of the structure of one of the toxins (ExoS) and how it binds to the human protein. But it was unclear how this contact could give rise to the bacterium's toxic effects. The team has now found a large, hydrophobic contact interface between the human protein and the bacterial toxins and shown that if this surface is not protected by the human protein, the toxins form inactive clusters in the cell's water-soluble environment. In other words, the protein makes the bacterial toxins active by acting as a protective "chaperone". This newly identified contact interface presents a possible target for drug molecules. The study identified two small organic molecules that can prevent the infection between the bacterial toxins and the human protein. It also shows that the toxins lose their toxic activity when these molecules are introduced. The effect is weak, but according to the researchers, the results show that the principle works. The previously known contact between the bacterial toxins and the human protein takes place in an area where many other proteins in the cell bind. Affecting this region with drug molecules would probably therefore cause serious adverse effects. The newly discovered surface can prove a more specific target. "Our study shows that it's possible to block toxin activity with drug-like molecules via an interface where no other proteins have yet been shown to interact," says principal investigator Herwig Schüler, associate professor of structure biology at the Department of Biosciences and Nutrition, Karolinska Institutet.